Despite its weakened status as a tropical storm, Florence has deluged parts of the North Carolina coastline with torrential and historic amounts of rain. Many areas in southeastern North Carolina have endured 15 to 30 inches of rain, and up to 10 to 15 more could fall in southern and western North Carolina. The rain is resulting in catastrophic flooding in southeastern North Carolina that is spreading into the state’s interior, even into the population centers of Raleigh and Charlotte. Already, the event has broken the state’s record for most rain ever observed during a tropical storm or hurricane, with a preliminary report of more than 30 inches. The storm has unloaded about 6 trillion gallons of rain so far, according to Ryan Maue, a meteorologist for weathermodels.com. By the time it exits the East Coast, he expects the number to rise to 18 trillion gallons, enough to cover Texas in four inches of water and fill the Chesapeake Bay. In other words, “we’re only about one-third of the way through this,” Maue said. The National Weather Service tweeted at least 10 million people are predicted to see at least four inches of rain through early next week. “#Florence is far from done,” it said. Through Saturday afternoon, numerous locations in southeast North Carolina had endured more than 20 inches of rain, with Onslow County being particularly hard hit. The Swansboro 30-inch total is the most for any tropical storm or hurricane north of Florida along the East Coast and represents a new two-day and three-day rainfall record for North Carolina. In the past year, Florence marks the third tropical system to set a new state rainfall record following Hurricane Harvey in Texas and Hurricane Lane in Hawaii. Since making landfall at Wrightsville Beach in North Carolina on Friday morning, Florence’s forward speed has slowed to nearly a stall. At 11 p.m. Saturday, it was drifting to the west at just 3 mph. The storm’s slow movement, parallel to the coastline, has created several bands of heavy rain, capable of producing two to four inches of rain per hour, sitting over the many of the same locations for essentially the past day and a half. Flash-flood emergencies — the most critical category of flood warning — have been in effect at times for several counties in southeastern North Carolina. Florence slowly edged to the southwest on Saturday, dragging the axis of heavy rain bands to the southwest, as well. While it spelled some relief for the inundated areas of Onslow County, it has unfortunately put the city of Wilmington, southeast coastal communities of North Carolina and northeast areas of South Carolina in the line of fire instead. Through Sunday morning, over a foot of rain is expected to fall in and around Wilmington, adding to the 14 inches the city has already received from Florence. The heaviest of the rain should gradually taper off in southeast North Carolina on Sunday. Most of the rivers in northeast South Carolina and eastern North Carolina are experiencing moderate to major flooding and, in some cases, many will continue rising well into next week as floodwaters from the interior flow downstream. 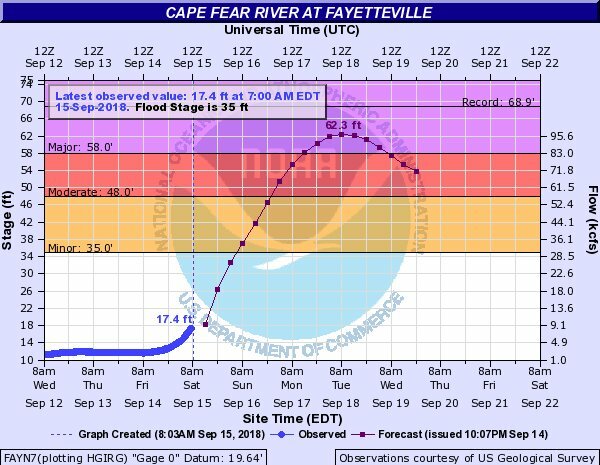 The Cape Fear River in Fayetteville, N.C., is forecast to rise an astonishing 45 feet by Tuesday, where a mandatory evacuation is in place. Water levels along the Lumberton River in Lumberton are forecast to top the record level set during Hurricane Matthew just two years ago. Flooding concerns extend beyond the coast of North Carolina, as well. Flash flooding has spread into Raleigh and will expand over Charlotte, where flash-flood advisories are in effect. Both cities could see six to 10 inches of rain, with locally higher amounts. Much of northern and western South Carolina are also forecast to receive at least 5 to 10 inches of rain, leading to possible flooding problems. As the storm center shifts farther inland, counterclockwise rotation around the center of circulation will continue to pull in loads of tropical moisture from the Atlantic Ocean and push it up against the more rugged terrain of central and western North Carolina. The elevation will serve as a forcing mechanism for the abundant low-level moisture being dragged in by Florence, essentially creating an ideal environment for torrential rain and the possibility of mudslides, especially Sunday into Monday. Through Tuesday, an additional 5 to 10 inches of rain are forecast to fall across central North Carolina and southwestern Virginia. In the high terrain of the western North Carolina, 10 to 15 inches are likely with localized higher amounts. A National Weather Service model shows the five-day rainfall forecast. Florence will gradually lose its tropical characteristics through Sunday, but the storm will continue be a danger as it starts to turn north. However, there remains a large amount of uncertainty regarding the ultimate track of the storm. Computer models mostly show the remnants of Florence tracking into western North Carolina on Sunday afternoon, before making a sharp turn to the north/northeast as the storm begins to get picked up by the jet stream over North America. However, there is still some disagreement among the models as to how much of the storm center motion is to the north vs. the northeast. If the storm tracks further to the west and up into the Ohio River Valley, the worst of the heavy rain and associated effects of the storm would be centered to the west of the Washington area and more focused toward western Pennsylvania and eventually interior New England. However, if the storm takes a more easterly track, much of the Mid-Atlantic would be exposed to a period of heavy rain and even the threat of some severe weather late on Monday and into Tuesday. At the moment, the National Weather Service predicts three to six inches of rain from west-central Virginia into far eastern West Virginia, north of Roanoke and west of Charlottesville through Tuesday.